Marvel Unlimited and comics have derailed my normal reading patterns for the past month or two, but I'm slowly drifting back toward my normal amount of book reading. 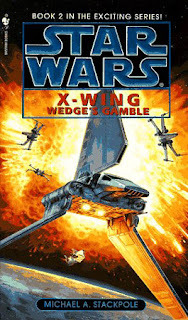 In doing so I finished the second book in the X-Wing series, Wedge's Gamble. This continues to be a great Star Wars series in their Legends universe. I loved these books as a kid and they're still holding up now. I'm surprised that they are as good as I remember. I think I read them as they were released so I never realized how closely the series is tied together. The first two books flow right into one another in a way that's great. A newcomer could pick up book two and start with it, no problem. But someone who has read the first book will see more connections and get more out of it. In Wedge's Gamble Rogue Squadron is tasked with taking down the shields surrounding Coruscant so that the Rebels can occupy it. The Rebellion is looking to finally overthrow the Empire's seat of power and establish themselves as a legitimate replacement government. It's a tall order but Rogue Squadron thinks they're up to the challenge. This time they're mostly on the ground on Coruscant using they're special ops training and unique skills to find a way to take down the shields. There are still X-Wing sections of the novel with dogfights and everything you could want, but the main focus here is on Rogue Squadron as an elite special ops force. It's really cool to see this other side of them. This is another great book that let's me recommend the X-Wing series again. If the premise of this one sounds more interesting than the first book you can easily start here and not feel left out.